As T2 Trainspotting hits UK home video, we take a listen to the iconic soundtracks of it and its 1996 predecessor. Trainspotting and its recently released sequel are marked out by many traits; kinetic and wildly creative direction, larger than life performances, and most importantly, an incredible selection of music. For many, the original film was so magical because it took the best of British music at the height of Brit-pop and matched its energy and outlandishness. T2 certainly continues in this vein, returning to some of the classics from the original while adding in some fresh sounds. To mark the home release of T2, we thought it’d be a great time to collect some of the best uses of music across the two films. It’s safe to say that when you mention Trainspotting, one of the first things many people think of is Lust for Life. The iconic Iggy Pop song is completely synonymous with the film thanks to an adrenaline shot of a first scene that introduced the world to Begbie, Sick Boy, Spud and Renton as well as the latter’s ‘choose life’ speech, a biting take down of corporate Capitalism and the political landscape of the late 1990s that remains as funny and poignant today as ever. As for T2, it was hard for Danny Boyle to return to the song without being derivative, but he manages the task impeccably by bringing in a Prodigy remix in the final moments of the film. Easily one of the finest moments of Boyle’s masterpiece; this Lou Reed accompanied scene follows Renton as he relapses and returns to heroin, overdoses and is taken to the hospital. These kind of scenes can often be fairly ham-fisted in the hands of lesser directors, but through a few effective devices, Boyle creates one of near perfection. 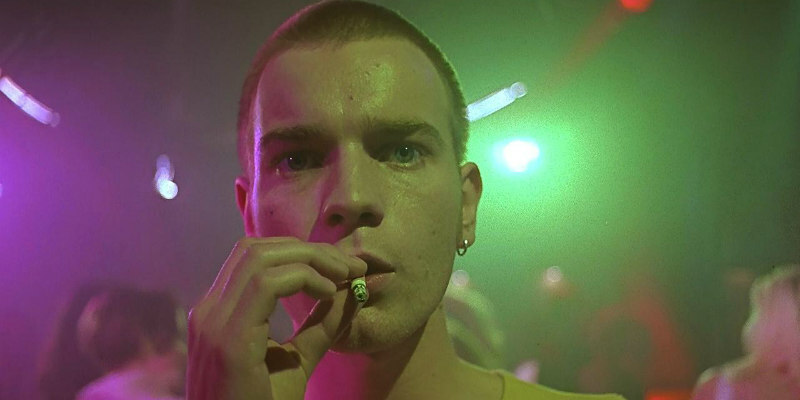 He uses simple but imaginative visuals as Renton falls through the carpet, frequent POV shots and a song that builds throughout, and forms an intensely moving and unnerving scene. For anyone who loves Trainspotting and has been hoping for a sequel in any form, this scene is probably their most anticipated: the standoff between Renton and certified psychopath Begbie, years after the former ripped him off. Boyle certainly pulls it off, creating an intensely exciting scene aided by a well placed reference to the original at the end. This is all of course accompanied by Frankie Goes to Hollywood’s Relax, which furthers both the tension and absurdity of their meeting. The end of Trainspotting is arguably one of the finest endings in cinema history, but it would lose much of its impact without a song to match. In Underworld’s Born Slippy, the film is able to emphasise and communicate many of its central themes/points. The fast electronic thudding of the drums perfectly shows Begbie’s manic anger as he discovers Renton’s betrayal, as well as Renton’s mindset as he decides to do so. This is not to mention the distorted vocals and synths, which reflects Renton’s perhaps naive hope that he can make a fresh start. T2 debuts on Digital May 22nd and on DVD, Blu-ray and 4K Ultra HD on June 5th.